All students must follow a Core Curriculum of subjects which are mandatory and which will provide you with a broad and balanced subject base. Students will also have the opportunity to develop their own personalised timetable by selecting additional Options subjects to study. It is important that you enjoy learning. We want you to pick courses that you find interesting, play to your strengths and develop your skills. You should consider carefully how these choices will affect your future at Blacon High School and beyond. Consider a broad range of subjects. Choose subjects that you like and are good at. Think about how your choices will affect your future career. Don’t let your friends’ choices influence yours! How many choices can I make? All students must study the Core subjects and are then able to select a number of Options subjects (dependant on their pathway) to complete their curriculum choice. In Pathway 1 Students must follow their Core curriculum and are required to select one subject from each option block (1 and 2). This must include a Humanity – either History or Geography. In Pathway 2 Students must follow their Core curriculum and are required to select one subject from each option block (1, 2 and 3). In Pathway 3 Students must follow their Core curriculum and are required to select one subject from each option block (1, 2 and 3). How do I indicate my choices? Study carefully the subject information that follows and be sure to understand what the course will ask of you. Discuss your options with your parents, teachers and progress leader to make sure you are making the right decisions. Once you have made your final choices complete the option form and return it to your form tutor. When you have made your choices, numbers have to be balanced in teaching groups and then the timetable is prepared. This is a long process and it cannot be readily changed. Occasionally, a few changes are permitted in the first few weeks of the Autumn Term but only when numbers allow this. Will I automatically secure a place on my first choice course? The range of subjects offered now, at the planning stage, may have to be modified because of staffing or other constraints. It may be necessary to limit numbers for safety reasons and for access to equipment. Students’ levels of attainment and progression in key stage 3 will be taken into consideration before confirmation of final choices. How will my attainment and progression be recognised? Subjects can be assessed in many different ways. It is important to think about which style suits you. Examinations – most GCSEs have an exam but this can vary in terms of number and length. The question style can also vary considerably. Controlled assessment – this is similar to coursework, marked by teachers but done under controlled conditions, usually in the school hall or classroom. Coursework – this type of assessment is flexible and students have a lot of control over the outcome. Portfolio – as in BTEC and Vocational courses – students complete a wide range of assignments which may be practical or written and build up evidence towards a qualification. In the White Paper, The Importance of Teaching, published on 24 October 2010, the Secretary of State announced the introduction of the English Baccalaureate. The Government believes that schools should offer students a broad range of academic subjects to age 16, and the English Baccalaureate (EBacc) promotes that aspiration. The EBacc is not a new qualification in itself. It will recognise students’ good GCSE passes across selected core academic subjects. The English Baccalaureate will cover achievement in English, Mathematics, Sciences, a Modern Foreign Language and a Humanities subject. Students’ individual achievements will be marked through a certificate and students will need to achieve an A* to C in each of these subjects. All students at Blacon High School have the option to study for the EBacc. For students to achieve the EBacc they would need to choose French and either History or Geography GCSE options as well as studying GCSE English, Mathematics and Science. 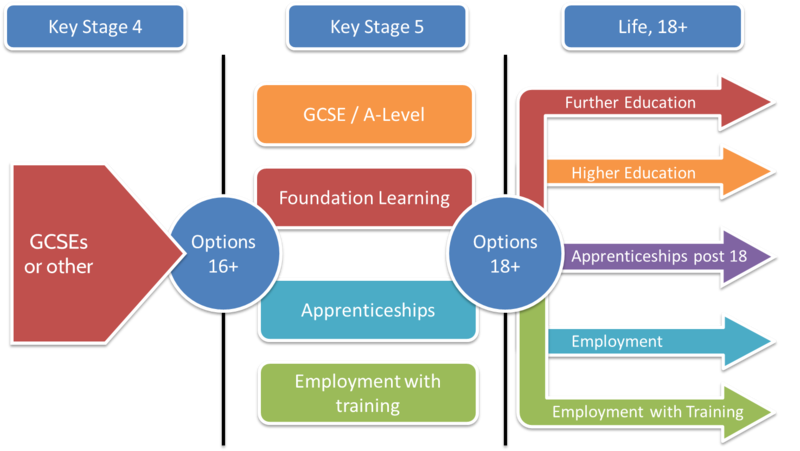 The EBacc and the qualifications which can contribute to it are still subject to change. Regular attendance is the key to success. If you only attend 90% of the time you can expect to lose the high grades you are capable of achieving. Anything less and you will struggle to complete the course requirements.